There are over 60,000 2-5 year olds in Surrey out of a total population of approximately 1.1 million and their needs vary across Surrey. Woking has the lowest proportion of five year old children free from dental decay in Surrey and is close to the national average. Waverley has the highest proportion of five year old children free from dental decay and is one of the wealthiest areas of Surrey whereas Woking is less affluent and has a higher level of ethnic diversity. The NHS spends an estimated £131m per year on emergency hospital admissions because of childhood injuries. Across Surrey there are a variety of services that go some way to addressing the health needs of our 2-5year olds. Early Years settings work within the Healthy Food Trust guidelines to ensure the food served is nutritious and healthy. The Oral Health team has delivered training to Health Visitors, Children Centre staff, Early Years staff, School Nurses and teachers. www.healthysurrey.org.uk and www.nhschoices .nhs.uk can be accessed for information regarding health. Health Providers and Early Years have worked together to develop the integrated check which improves communication between the two services to identify any needs a child may have early on. However, there are gaps in services which is resulting in poor health for those that most need it. There has been a small increase in specialist early years nursery places, however the number of places is still not able to meet the demand. Across Surrey there are a variety of services and campaigns which can work towards improving the health of our 2-5yr olds. Support Children Centres to continue to work with families and their children to maintain healthy lifestyles and support those that need it. To support professionals to work in partnership to ensure consistency of health messages for families and their 2-5year olds. There are over 60,000 2-5 year olds in Surrey out of a total population of approximately 1.1 million. The first five years of a child’s life are critical to their future development and opportunities, therefore, one of the most important foundations for building caring, productive and healthy families and communities is the nurturing of children in early life. For this reason helping children get a better start is both good for them and good for society. In addition to this there is also mounting evidence that shows the benefits and cost effectiveness of focusing on the development and health of infants and children(1). 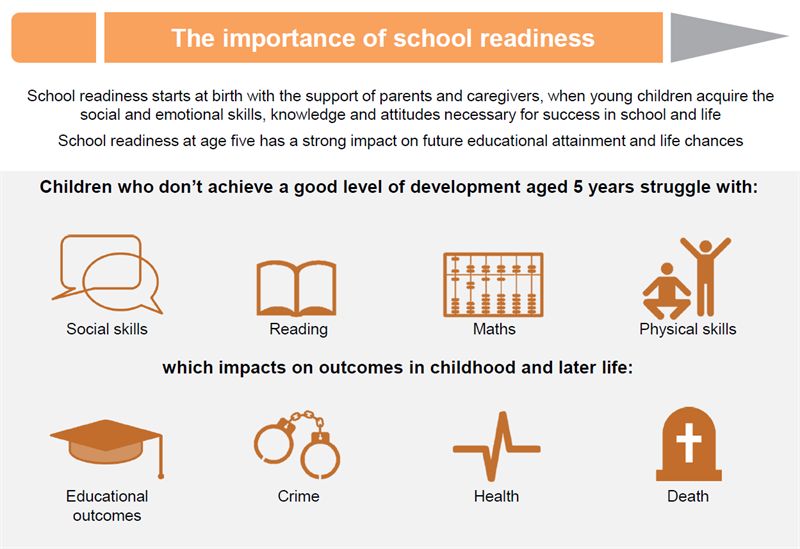 A child’s physical, social and cognitive development strongly influences how ready they are to start school and their educational attainment, as well as their health and employment prospects as an adult (2). This development begins before birth when the health of a baby is affected by the health of their mother and is influenced by the socio-economic status of their parents. Low socio-economic status is the most important of these factors. The best possible start underpins a child’s ability to flourish, stay safe and achieve as they grow up; and lifestyles and habits established during childhood, influence a person’s health throughout their life. As part of this parents and families are at the heart of the process and maternal health during pregnancy, and the home environment and parenting in infancy and toddlerhood, are critical(3). In addition to the commissioning of the 5-19 service, the Local Authority became responsible for commissioning public health services for 0-5 year olds on October 1st 2015. This provides further opportunities to ensure a coordinated pathway of evidenced based preventative health care for all children from birth, all the way through their crucial development during preschool and school years. The increasing trend in overweight and obesity rates in children and young people has become a local and national priority. Current estimates show that by 2050 nearly a quarter of children 2-15 years in the United Kingdom will be obese and nearly 40% will be overweight(5). As with most areas of child development the earlier positive food and physical activity messages are given, the greater the likelihood of them continuing into adult life are. A really important milestone in a baby’s life is introducing solids. This is their first experience of different tastes and smells and they can start deciding what they like and don’t like. It is also an opportunity for parents to initiate good feeding patterns and for all the family to eat together and enjoy meal times. As Mary Rudolf (6) explains in her Framework for Action, modelling healthy eating and physical activities is key to encouraging healthy living in our children. The underlying cause of obesity is an energy imbalance whereby energy consumed is more than the energy expended. While children and young people have to ensure their intake is meeting their requirement for growth, a balance must be maintained. If energy intake in children (food and drink) exceeds energy output (resting metabolic rate and activity) and there is more energy than required for appropriate growth the excess energy will be stored as excess fat (9). Children living in poverty or from some Black and Minority Ethnic (BAME) groups are at higher risk of being overweight or obese. Each year, as part of the National Child Measurement Programme (NCMP) children in Reception and Year 6 are weighed. A national NCMP report comparing changes in children’s Body Mass Index between 2006/7 and 2013/14 (10) showed a significant upward trend across both age groups, particularly in Year 6 boys and Year 6 Pakistani and Bangladeshi girls but also reported a widening inequality gap for those living in deprivation. NCMP data for Surrey 2015/16 shows that in Reception 16.6% of children were either overweight or obese. This is a reduction from the previous year (17.9%), however both Spelthorne and Surrey Heath data showed a prevalence of 19.1% and 18.3 %. This supports the results of national reports which shows increasing health inequalities for those living in areas of deprivation. Oral Health During the Early Years, whether it’s their first tooth, or their visit to the dentist, a child’s early experiences of oral health can impact on the rest of their lives. Poor oral health can impact on a child’s quality of life. It can lead to pain, difficulty in eating and school absence, and can result in impaired nutrition and growth, resulting in a reduction in overall wellbeing. All of these consequences can also have an economic impact on families and the wider population. Past caries experience. (11)The individual susceptibility to decay which is determined by the type of bacteria in the mouth and the shape of the teeth. The amount of fluoride exposure. The child’s dietary sugar intake. The most common reason for children under 10 to be admitted to hospital is for the planned extraction of teeth under a general anaesthetic. Older children are more able to cope with the stress of having a tooth extracted and sedation techniques can be used safely in primary care settings if extraction is required. However, extraction should only be a last resort with more emphasis placed on the prevention of disease and improving attendance rates especially in lower socio economic groups and very young children. This would mean that any decay could be treated at a much earlier stage with a greater chance of the children being able to accept a more minimal intervention. The main impact of decay, when it is so severe that extractions are required, is the levels of pain and distress to the child, which can also affect their concentration at school and their sleep patterns. The impact extends to parents and carers who may need to take time off for the children to have teeth out in hospital as well as having endless sleepless nights caused by the child’s crying. Children with special educational needs and disabilities are a diverse group, some require multiagency support across health, social services and education for highly complex needs, while others require much less support. The numbers of Surrey children and young people with special educational needs and disabilities (SEND) are growing, therefore, we need to manage our resources more efficiently and bring them into line with other local authorities. Research suggests that disability prevalence varies according to socio-economic background, with children from semi-skilled and unskilled manual families having a higher prevalence of both mild and severe disability than children from professional family backgrounds (16). There is a lower prevalence of disability in younger children which is likely to be due, in part to the later manifestation of a range of conditions, some conditions becoming more activity limiting as the child gets older (17), and the high reliance on school Special Educational Needs (SEN) data which may miss children of preschool age(18) . The latest national data suggests that younger children are more likely than older children to have speech, language and communication needs as their primary type of special educational need than older children. This chapter will focus on the provision for 2-5 year olds through their Children’s Centres and Health Visitors. For more detailed information on SEND children please refer to the Children and young people with Special Educational Needs and Disabilities (SEND) JSNA chapter. Immunisations: Surrey consistently has below the England average for vaccinations for all age groups including 2-5 year olds. The leadership, coordination and organisation of vaccination programmes are important in ensuring a high uptake. Immunisation is, after clean water, the most effective public health intervention in the world. It is the process of protecting individuals from infection through passive or active immunity and protects individuals and the population against serious diseases. If a person is not immunised, they will be at risk from catching the disease and will rely on other people being immunised to avoid becoming infected. If people choose not to be immunised, then the number of people at risk of catching a disease will increase and outbreaks of the disease will occur. Low uptake of immunisations puts others at risk when there is herd immunity of less than the recommended percentage uptake for public protection. To find more in-depth analysis of immunisation data please refer to the Immunisation and Screening JSNA chapter. The Health Survey for England (HSE) has monitored the trends of excess weight nationally among children aged 2-15 over the last 20 years. Obesity peaked at 19% among boys in 2004 and girls in 2005. Levels of obesity have been slightly lower since. In 2014, obesity among boys reached the peak level of 19% again, whereas for girls obesity was at a lower level, at 16%. The percentage of overweight (including obese) children aged 2-15 since the peak at 34% in 2004 has remained fairly stable at around 30-31% over the last 10 years with the exception of 2012 when it dropped to 28% . Locally it is possible to estimate the total number of children aged 2-15 in Surrey who are overweight or obese, using the HSE data (2014). This data approximates that across Surrey 62,000 children are overweight or obese, of which, 34,000 are estimated to be obese. The National Child Measurement Programme (NCMP) data, provides further information which can be found in in the Schools and Developing Healthy Lifestyles JSNA chapter. The HSE numbers indicate that there are slightly higher numbers of boys than girls who are either obese or overweight. Dentistry for children under 18 is free with the exception of cosmetic dentistry such as the correction of minor tooth displacement. The NHS measures access to NHS dentistry by the percentage of the population that has accessed a dentist within the last 24 months. Data from the NHS Business Services Authority in 2015 showed a variation in the proportion of children under 18 accessing dental services from 41% to 87% across Surrey wards. More up to date data is expected shortly. The same data showed access among very young children is poor but does improve as they get older. However it was below England’s average. The local data for oral health shows a significant variation in the proportion of five year old children free from dental decay across the 11 Districts and Boroughs as shown in the Tableau data visualisation. The proportion ranges from 75.3% in Woking to 91.9% in Waverley. The number of children sampled in Tandridge was too small for the data to be reliable. It is this significant variation that gives rise to concern especially as Woking is above the England average for decayed, missing and filled teeth (dmft 0.8). (24) This significant variation can be explained in part by the more ethnically diverse population in Woking compared to Waverley. Waverley is one of the wealthiest parts of Surrey with low levels of relative deprivation whereas Woking is less affluent. Unintentional childhood injuries carry significant costs to the economy, the NHS and children and families. Admitting a child to hospital following unintentional injury in the home is estimated to cost £16,900. The same source puts the cost of a road traffic injury at three times this, in excess of £50,000. The NHS spends an estimated £131 m per year on emergency hospital admissions because of childhood injuries (25). More information can be found in the Unintentional Injuries JSNA chapter. 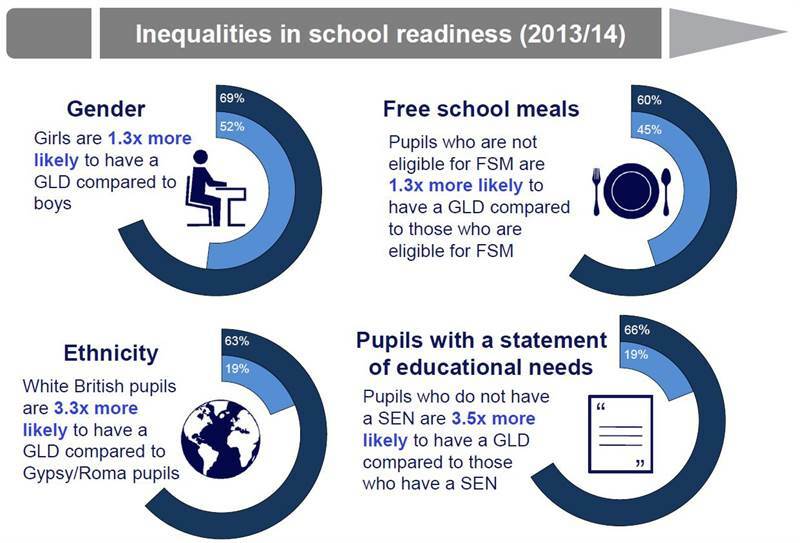 The Public Health presentation(26) on improving school readiness highlights the inequalities found in levels of school readiness in 2013/14 nationally. Girls are more than1.3 times more likely to have good levels of development (GLD) compared to boys while children who do not receive free schools meals are 1.3 times more likely to have GLD than those that do. Ethnicity impacts on children’s levels of school readiness with Gypsy Roma children 3.3 times less likely to have a GLD than their white British counterparts. Children who do not have special educational needs are 3.5 times more likely to have a GLD than those that do. In 2014/15 72.6% of Surrey children were achieving a good level of development at the end of reception which was higher than the national average of 66.3%. 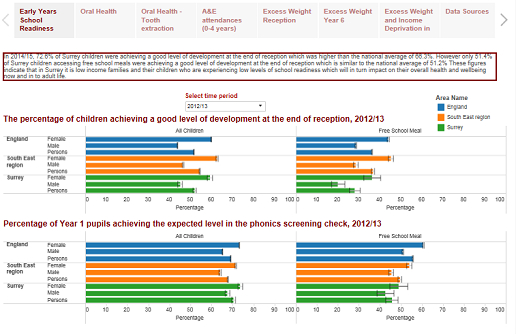 However only 51.4% of Surrey children accessing free school meals were achieving a good level of development at the end of reception which is similar to the national average of 51.2% These figures indicate that in Surrey it is low income families and their children who are experiencing low levels of school readiness which will in turn impact on their overall health and wellbeing now and in to adult life. Public Health in Surrey in partnership with local community health provider infant feeding leads have produced the Infant Feeding Guidelines document(27) to guide and assist parents with the introducing of solid foods. This is a useful directory of leaflets, websites and help lines to support parents with feeding. For more information on infant feeding please access the Breastfeeding strategy 2016-2021on Heathy Surrey www.healthysurrey.org.uk. HENRY (Health, Exercise, nutrition for the Really Young) is run in 34 children’s centres in Surrey who are able to offer the 8 week HENRY Group Programme. The majority of these are within the top 30 most deprived areas. It is award winning work which has the strongest evidence base of any early years obesity prevention scheme in the UK and is grounded in the latest research into both the factors contributing to child obesity and the qualities of successful child obesity programmes. Children’s Centres ensure that healthy snacks of fruit and water are always available at their play and stay sessions and displays promoting the Eat Well Plate are located within the centres. They also run a range of physical activity sessions for under 5yr olds and their families to promote healthy lifestyles such as children’s swimming classes, buggy walks, sports for tots and ‘Be Active’ day events. Change 4 life promotional material is available throughout the centres for parents to access. Health Visitors promote healthy weight and healthy lives at every contact and refer under 5years old and their families to their Local Children’s Centre. Early Years settings work in partnership with Family Nurturing Links to provide Healthy Food Trust Guidelines to ensure that the food being serves with in the setting is nutritious and healthy. They also run a targeted programme for staff to be trained to identify children at risk of obesity and put in early intervention to support the child’s healthy development. All settings receive regular bulletins updating them on the current health promotion campaign and encouraging them to promote it to the families they work with. Future training sessions have been planned for teachers. Training has always been delivered as part of other public health training, such as health protection and nutrition. The dental public health team wanted to collaborate with wider groups, beyond dental teams, to ensure oral health promotion in the community is part of ‘making every contact count’. Setting up a specialised Gypsy, Roma and Traveller (GRT) working group on how best to deliver oral health promotion to this hard to reach group, with particular focus on health messages being culturally sensitive. The group consists of members from public health, dental public health, health visitors and GRT liaisons. Setting up focus groups with GRT communities to gauge how best to reduce inequity of access to dental services with this population, and understand any barriers they may face when accessing care. Oral Health promotion has been delivered to young carers and oral health information is about to be included on a national young carers website. A booklet has been produced by Surrey County Council to answer frequently asked questions which carers of looked after children commonly have regarding oral and dental health. Further targeted audience booklets, are in discussion for the homeless and substance misusers. Alongside the published oral health strategy and contributions to public health documents, the Healthy Surrey website has been updated. This includes detailed information on a wide range of important health issues and oral health topics including access to dental services, dental conditions, emergency treatment and oral health promotion linked with general health promotion. Several training sessions have been delivered for early years, school and other children’s services. To ensure this continues oral health promotion has now been included in all the health visitor contracts and it is now mentioned at every parent visit and discussed at the 1yr and 2yr reviews. The dental public health and public health teams at Surrey County Council have worked hard to incorporate oral health messages at every suitable opportunity. Further work continues to be done, mainly focused at improving the oral health of children residing in the most deprived areas of Surrey, or those who are often hard to reach. Access to an NHS dentist is readily available across Surrey with more than 180 NHS dental practices and 26 Specialist orthodontic practices. Contact details for these practices can be found at www.choices.nhs.uk. In 2013/14 40,493 Surrey 0-4yr olds attended A&E which is 550 per 1000. This is significantly higher than the national average which is 525 per 1000. A number of measures have been put in place to address this issue, in addition to these, Guildford and Waverly CCG proposed the development of a Health Visitor and A&E Nurse led training delivered in Children’s Centres. The aim was to offer support, training and develop parents confidence to manage their children at home and reduce unnecessary A&E attendances. The Consumer Health Information Centre and Developing Parent Partnerships (2003) found that one in four parents would take their child to A&E to be treated for minor ailments. Data has shown that children are taken to A&E by their parents with minor illness and injuries that could be managed at home with support from community services such GPs and Pharmacies. Illness such as gastroenteritis and upper respiratory tract infections, along with unintentional injuries caused by accidents in the home, are the leading causes of attendances at Accident & Emergency and hospitalisation amongst the under 5s. Children’s centres run a variety of sessions for under 5yrs and their families to improve health literacy such as paediatric first aid for parent, health and safety sessions in the home and safety week. There are useful resources that can be accessed from The Royal Society for the Prevention of Accidents website http://www.rospa.com/ . Early years settings send out regular updates on home safety and reducing unintentional injuries through their bulletin. Following on from the NICE guidance, and a recommendation from the Surrey Child Death Overview Panel, the South East Coast Clinical Network, in collaboration with CCG colleagues in Surrey and Surrey Public Health Team, have worked together to produce a leaflet on head injuries, to address the recommendation in the guidance. The leaflet has been distributed to schools, childcare, early years, voluntary and sports settings across Surrey. There is a child friendly version available as well. The integrated check carried out by the Health providers and Early Years settings supports school readiness and aims to highlight any additional needs a child might have with the hope that by identifying them early they will be addressed in time for school. When a child turns two they will be offered two different development reviews. One is carried out by a health visitor and is called the 27 month development review. The other will take place at the child’s Ofsted registered childcare and is called the two year progress check. Each review will still be carried out separately but ideally the childcare provider should complete the progress check before the development review happens. Parents then take the progress check summary to the development review so the health visitor can look at the information. If the health visitor feels the child needs more support they will then work with the childcare provider to make sure that happens. The progress checks are a statuary requirement for all early years providers registered for free early education for 2,3 and 4 year olds through the Early Years Foundation Stage (which is the curriculum they need to follow set by Ofsted). When Ofsted inspect they will expect to see it being carried as part of tracking a child’s progress. If the two year progress check identifies a child as SEND then the provider will discuss the outcome with the parents and make referrals to the appropriate professionals with the consent of the parents. Families with children that have been identified as SEND are contacted by the Health Visitor and invited to attend their 27 month development review. If the 27 month developmental review identifies a SEND child then the Health Visitor would complete an action plan with the family to identify help they may need if they want it and appropriate referrals would be made. If a child does not attend a childcare provider and their parents do not want to attend their 27month developmental review or want any help from the Health Visitor then they would look at the history of the family and other professional they may be involved with. If the Health Visitor still had concerns after this then they would contact the safeguarding board. The childcare provider can alert the Health Visitor to vulnerable families and vice versa by improved communication through the red book and sharing information. Surrey County Council commissions the HENRY programme (healthy eating and nutrition for the really young) which provides training to Children Centre staff and Health Visitors to deliver healthy nutrition advice for families with 0 to 5 year olds. As of September 2016 164 Health Visitors and 397 Children Centre staff have been trained with further roll out planned over the next 18 months. However capacity issues amongst Health Visitors is resulting in courses not being run and therefore the need is not being met. The data tells us that support should be offered universally with a targeted focus on families living in Spelthorne and Surrey Heath. Every child should see a dentist by the time they are 1year old, however, only 50% of Surrey under 5 are registered. It is important for the improved oral health of our children that this increases so that their parents/carer can access advice and intervention be given if needed from an early age. Oral decay can start from age one so if those that are experiencing it do not see a dentist before they are 5 then the early intervention they need is not received. Decay in young children is primarily in the back teeth of which 5 year olds have 8. The back teeth are usually fully erupted by about 2 years old and it is these teeth that are the most susceptible to decay. This data shows that of the children who do have decay almost half their back teeth are affected. The data also shows that for those children who have decay there is significant variation in the severity of disease experienced across Surrey. Of the 14,605 3 year olds in Surrey, 511 of them were examined for the Public Health National epidemiology programme survey of 3 year olds. In Surrey the dmft level (amount of decayed, missing and filled teeth) was 0.11 (5%), significantly below the England average of 0.36. (28) Parents/carers need to be educated around the importance of early oral health care for their children and dentists need to work to encourage children as young as one to attend appointments. The message of early oral health care needs to be holistically delivered through school nurses, supported family programmes, child measurement programmes, social workers, Health Visitors and children centre staff to encourage parents to access their dentist. The minor illness training pilot was limited to 4 children’s Centres across the county and therefore could only work with a small number of parents. Although the evaluation was extremely positive and 100% of those that had ill children said that the information they learned on the training helped them make their decision it has not been delivered anywhere else in the county. According to Guildford and Waverly A&E data for 0-5yrs the number of those attending has increased for 2015/16.Therefore running this kind of training is really important. As has been discussed earlier improving parent’s confidence to care for the sick children is key to reducing A&E admissions. According to Public Health data in 2015/16 only 50% of children received their 2- 2 and half year old review. This is below the national average of 73% and significantly below the target of 95%. This could result in children accessing support services later than they could have if they had attended the check. The earlier a child’s support needs are identified the higher chance they have of achieving school readiness by age 5. In 2015 -16 76% of children aged 5 years achieved a good level of development at the end of the Early Years Foundation Stage, indicating that they deemed to be ready to start school. The 24% that did not achieve this level of development include children who narrowly missed the level, as well as those with complex additional needs. Frequently for the children who nearly achieved a good level of development their lower levels of attainment came in the prime area of communication and language. This may be exacerbated for some children by the length of time it takes to see a therapist in some parts of the county compared to others and the demands on the health service in areas where the majority of children do not reach the Surrey average level of attainment. There has been a small increase in specialist early years nursery places, however the number of places is still not able to meet the demand. The Tackling Obesity, The Foresight report (29) (2010) and the Overcoming Obesity, An Initial Economic Analysis, The McKinsey Global Institute report (2014) (30) recommend taking a whole system approach to obesity. This would include policy and initiatives in areas such as the environment, e.g. travel, work place, individual psychology and food environment. In August 2016 the UK government published their strategy “Child Obesity, A Plan for Action(31) ” which included, for the first time a sugar levy on sweet drinks together with a number of actions for local government and health organisations. Children’s centres can support local ambitions to reduce obesity through enabling children and their families to maintain a healthy diet in line with national guidelines. Children’s centres can do this by supporting local and national campaigns (i.e. Change 4 Life) and providing information and education to the families using the centre. Children’s centres can also help encourage healthy eating within the children’s centre, by setting an example where food is provided. Children’s centres can also support increased physical activity, increased education and awareness for physical activity by providing opportunities to take part in active play within the centre. Children’s centres can also encourage active travel (i.e. bicycle, scooting or walking) to the children’s centre which can be supported through providing a safe place to store scooters or bicycles. Children should start going to the dentist as soon as the first tooth appears to familiarise themselves with the environment and for the parents and carers to receive advice on caring for the teeth and good diet. The dentist will start to examine the child at about 18 months as the child learns to be more co-operative and confident. The guidance to dentists on prevention recommends all children to have their teeth treated with a fluoride varnish twice a year to help prevent decay. Those children who have a higher risk of decay should have fluoride applied more regularly. Everyone involved should be using as many opportunities as possible to help families maintain children’s oral health and ideally be decay free. We all have a duty to protect children from getting such bad decay in their teeth that they have to be admitted to hospital for a general anaesthetic and access rates to NHS dentistry should improve to at least better than the National average. Tackling inequalities and promoting oral health is essential to reduce the burden of oral disease in Surrey’s child population. In January 2015 a working group was formed to develop and deliver the Minor Illness training in 4 children centres across Surrey in March/ April and October/November 2015. These were The Spinney and Hazel Avenue in Guildford, The Red Oak in Merstham and Woking Children Centre in Woking. The training was 2 hrs long and was delivered by a Health Visitor and A&E Nurse who covered rashes, hydration, breathing, temperature, immunisations, and services. A total of 46 parents attended the sessions across the 4 children Centres. All of those filled out an evaluation form (attached) after the training to feedback on how they felt it met the aims and objectives. Then 17% received a follow up phone call 3 months after they had attended the training to find out if it helped them if their child had been ill. The training aims to deliver health promotion and education to help parents become confident in their children’s care and for the process to potentially reduce their future attendances at A&E for minor illness/injury. The integrated check ensures that consistent messages are being given across the county that early identification of developmental issues enables them to be addressed promptly. A parent fed back in the Central Surrey evaluation (32) that they felt the professionals carrying out the check “listened & advised sensitively & [were] positive about how to overcome, continue or change things.” All services involved in the checks share publicity which again strengthens the consistency of the messages being given to parents. Health providers and the Early Years and Childcare Service frequently collaborate on supporting providers to understand child development. Examples of good practices are the integrated review at 2.5 years and the Speech and Language therapy resource pack. Both of these initiatives were jointly launched and anecdotal feedback has been very positive. There is a comprehensive training offer to support children transitioning to schools, this includes areas of learning and development, child development and special educational needs and disability. Where children have additional needs transition meetings are held in the summer term to support children going into reception classes. In addition Children’s centres offer a wide range of courses, guidance and support for parents as well as linking with early years providers in their reach area. Ensuring all health professionals always talk to parents about their family’s diet by using the “Making Every Contact Count” (MECC) resources as well as targeted training for midwives and health visitors. For evidence based healthy weight messages at new contact points e.g. immunisation programmes. Use the 2.5 year check to share information and prepare families for NCMP in Reception Year. Offer healthy weight training to appropriate groups and advocates in community and voluntary sector. Children and young people (CYP) and their families are at the heart of commissioning. There is an integrated approach with partners for oral health improvements. Commissioning for oral health improvement is across the life course, adopting the principle of universal proportionalism. To ensure that the leaflet is accessible online. To offer further training across the County. To promote the importance of immunisations across Surrey to increase uptake by having the information on the red book. To look into developing an app which can be used by parents as an additional resource to the training. Extend the locations for the delivery of therapy sessions. Ensure the model of therapy delivery dovetails into the Surrey County Council speech and language service for children in schools. Continue the integrated approach between Early Years and Health to carry out the 2 yr checks Continue to fund publicity encouraging parents and carers to attend these. 1. The Social Research Centre at Dartington (2013). Better Evidence for a Better Start The ‘science within’: what matters for child outcomes in the early years. Available at: http://betterstart.dartington.org.uk/wp-content/uploads/2013/08/The-Science-Within.pdf. 3. The Social Research Centre at Dartington (2013). Better Evidence for a Better Start The ‘science within’: what matters for child outcomes in the early years. Available at: http://betterstart.dartington.org.uk/wp-content/uploads/2013/08/The-Science-Within.pdf. 4. Department for Education (2013) Working Together to Safeguard Children: A guide to inter-agency working to safeguard and promote the welfare of children. HM Government. 5. McPherson K, Marsh T, Brown M (2007) Foresight Tackling Obesity:-Future Choices- Modelling Future Trends in Obesity and their impact on Health. Government Office for Science. 11. Yip K, Smales R. Oral diagnosis and treatment planning: part 2. Dental caries and assessment of risk. British Dental Journal. 2012; 213(2): 59 – 66. 12. Rothen M, Cunha-Cruz J, Zhou L, Mancl L, Jones JS, Berg J. Oral hygiene behaviors and caries experience in Northwest PRECEDENT patients. Community Dental Oral Epidemiology. [Online] 2014 ; 36. Available from: doi:10.1111/cdoe.12107 [Accessed November 2014]. 13. Shearer DM, Thomson WM, Broadbent JM, Poulton R. Maternal Oral Health Predicts Their Children’s Caries Experience in Adulthood. Journal of Dental Research. 2011;90(5): 627-677. 14. Mattila ML, Rautava P, Sillanpää M, Paunio P. Caries in five-year-old children and associations with family-related factors. Journal of Dental Research. 2000;79(3): 875-881. 15. Surrey i. Joint Strategic Needs Assessment: Health inequalities. [Online]. 18. Department for Children, Schools and Families (2008) Transition: moving on well. A good practice guide for health professionals and their partners on transition planning for young people with complex health needs or a disability. 19. Mundy, N (2015) Healthy Literacy in Children and Young People, Surrey Public Health.